Summer is here and you want to have a flawless skin that will make feel confident and beautiful. We have good news for you! 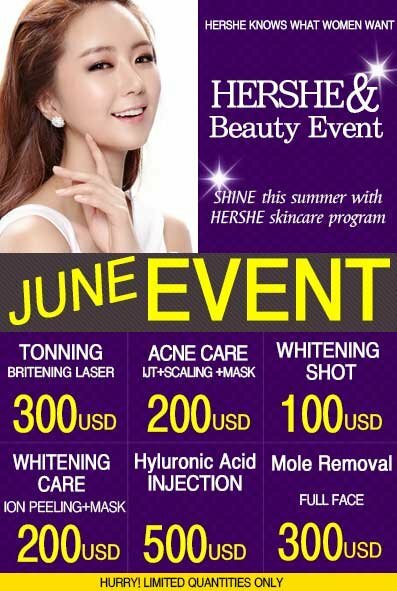 With the HERSHE Beauty Event you benefit from affordable prices for variety of procedures, including toning, whitening, mole removal or hyaluronic acid procedure. HERSHE clinic uses innovative procedures and equipment such as the PICOSURE treatment. This latest technology laser machine is 100 faster than the Nano second laser devices. Picosure is used to treat various skin lesions and reduces the number of required treatments from 10 times to 2-3 times. It is effectively used to remove birth marks, blemishes, freckles, to reduce wrinkles, acne treatment and skin rejuvenation. Thermage CPT is the latest version of the original Thermage laser. It delivers high-frequency wave energy into the dermis layer of the skin and the subcutaneous fat layer, stimulating young collagen fibers to rejuvenate skin elasticity, making it young and healthy. Recommended for patients with saggy skin on the neck, cheeks, chin line and eyelids. This is the official upgraded version of the Fraxel. It can penetrate the skin deeper and wider, with no pain and increased accuracy. Recommended to patients who need wrinkle reduction, deep acne scar removal, scars from surgery, chickenpox or stretch marks or pore reduction. Get in touch with us if you want to know more about this event and benefit from these amazing discounts!